Police say 36 arrests were made in connection with an illegal rave held in Carmarthenshire over the weekend. Twenty-nine were for drug-related offences, four for for public order offences and three for drink-driving. 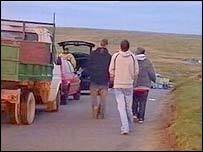 More than 300 people began camping at Betws Common, near Ammanford, on Saturday night, making their way up Betws mountain in convoys of vehicles. 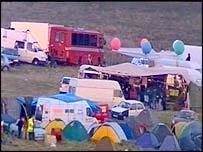 On Tuesday morning, Dyfed-Powys Police said the gathering had broken up and no officers remained at the site. Police said some people had been released on police bail, pending analysis of seized substances. A further 15 to 20 people were also cautioned for possession of cannabis. Police moved in on Sunday to try to break up the event but decided to let it continue. Inspector Tom Edwards of Dyfed Powys Police said: "They slipped in late on Saturday night. Of course, once they are encamped in a particular area, it's very difficult to get them out." There was considerable anger from people living nearby who complained about the noise and disruption to traffic. Carmarthenshire Councillor John Evans, who lives in Betws village, said he was concerned at the cost of cleaning up the mess left on the mountain. "It was quite intimidating for people living in Betws, when you have scores of people descending on the village and walking up the mountain," he said. "You had a situation where convoys of between seven and 10 vehicles were coming on the mountain 30 seconds apart. "It must have been well-organised. People had come from the Netherlands, France and Germany."